Editorial cartoonists are an endangered species, and even in their heyday they were rare birds -- at the top ranks of print journalism, only a few hundred such jobs existed worldwide in the 20th century. Yet those who wielded the drawing pen had enormous influence and popularity as they caricatured news events and newsmakers into "ink-drenched bombshells" that often said more than the accompanying news stories. Bill Sanders, working in a liberal tradition that stretches back to Thomas Nast and in more recent times includes Herblock, Oliphant, Feiffer, and Trudeau, began his career in the Eisenhower era and is still drawing in the age of Trump. In Against the Grain, he shares the upbringing and experiences that prepared him to infflict his opinions on the readers of the three major newspapers he worked for, the 100-plus papers he was syndicated in, and now, an internet channel. His memoir is both personal and political. He reveals his small-town Southern roots, his athletic exploits and military service, his courtship and enduring marriage, and his life-long passion for music. 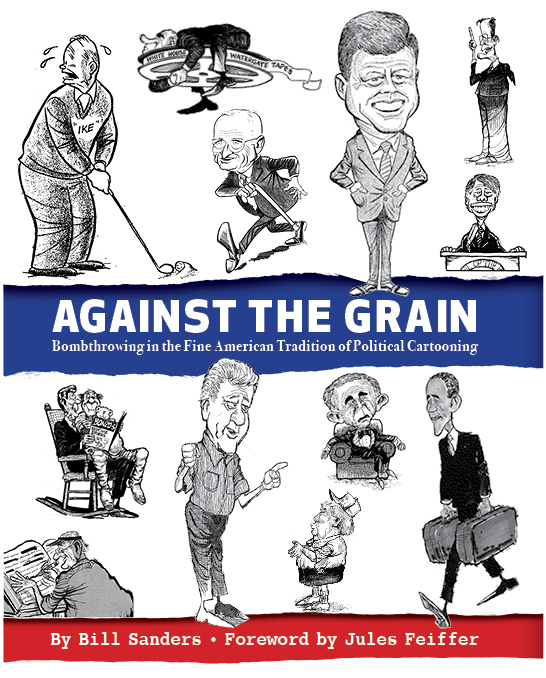 These threads are woven into his main narrative, explaining how a cartoonist works and why: "The cartoon should be a vehicle for opinion and it should be polemical in nature -- otherwise, it is a waste of time." "While there may be -- to varying degrees -- two sides to some issues, don't bother looking for that posture on the following pages."